A brief history of how this website came to be. 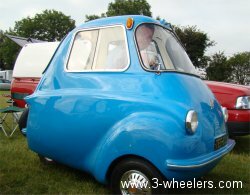 You are probably asking why on Earth would any one create a web site with an A-Z of 3-wheeled vehicles! Well it all started in 1990 just before I enrolled at Staffordshire University.(UK). For about 10 years I had been a motorcyclist and never even thought about wanting a car and so never needed to take a car driving test. I had a 1979 Yamaha XS250 which was by no means a speedster but was a heavy beast and great for touring. 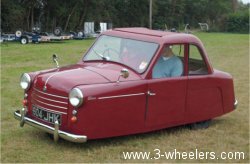 Sadly this was then stolen shortly before I was due to go to University and so I thought about a Reliant Robin on the basis you could drive that on a motorcycle license and I could pack a lot more in there than on a motorcycle. So after much thinking about the embarrassment it might cause I took the plunge and bought my first Reliant Robin. It was a 1974 N registration in Carnival Pink of all colours; owning a Reliant Robin was one thing but owning a pink one was something else. Needless to say I soon resprayed it “Electric Blue”. The Robin actually surprised me as it was a great little vehicle with its humble 750cc engine that would scream away as I hurtled up and down the motorway. If anyone tells you Reliant Robins are slow don’t believe them. If you are brave they will reach 90 mph ... not that I would ever do that and break the speed limit of course! I had that for a few years and did literally thousands of miles in it. I also joined the Reliant Owners Club (Birmingham Branch, UK) and would travel up and down the country to Reliant events and always had a great time. The Robin is a surprisingly social car. It was whilst I had my Robin that I did a history project on the History of the 3-wheeled vehicle and researched numerous 3-wheeler manufacturers. Partly because it sounded pretty interesting, partly because the actual Reliant Motor Company was on my door step and mostly because I could not think of what else to write about. Amazingly the project scored an A+ and I then turned it into a book which I was soon offered a publishing contract for. The only snag was that it was “vanity publishing” and I had to find £2,000 towards publishing cost. When your a student that’s a lot of Scrumpy Cider and Tuna sandwiches and so sadly I never took up their offer. I collected so much information at the time that I was only able to use about a quarter of it in my project so I decided to keep it one day and use it for something else, though I never quite knew what. Upon moving house, I rediscovered all the info in my parents loft and it just suddenly screamed to put entered on to the Internet, hence the creation of this site in July 2000. 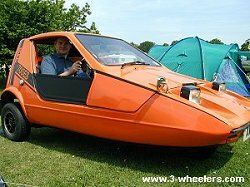 At one point I was also approached by the BBC TV program “Top Gear” as they used some of my information in a program about the Reliant Robin. As well as a few articles I have written, this web site has been on various Radio stations and on TV. Also in many magazines including the Practical Classics, Canadian Classics, Classic, Lledo Collector and Model Collector magazine to name just a few. I was also delighted when Microsoft e-mailed me to say they would include a link to this site in the Automobiles section of Microsoft Encarta. In October 2003 the site was even mentioned in the extras section on the BBC Only Fools and Horses DVD. My Robin was eventually put to sleep in 1993 when a lady in a dark blue Vauxhall Astra parked her car on my rear seat as I waited at the traffic lights one day. So GRE 33N (How I wish I kept that number plate as some one is now selling it for £9,000) was no more. I then bought a X reg Reliant Rialto and whilst it was a bit nippier than the Robin with its 850cc engine it just did not have the charm. There was something about the Robin that made people smile and want to get in it to see what it was like. Even people who jeered at 3-wheelers became so curious that they had to get in and have a look. If I had £1 for everyone who said, “One of your wheels have fallen off!” I would be on an exotic island now drinking cocktails all day whilst soaking up the sun. My reply of course would be to show them the spare wheel in the back of the car and say, “Don’t worry, I found it so I put it in here for safe keeping.” But, giving the Rialto its praises the passenger door mirror had a really unique feature that most executive cars don’t have and that was that at any speed over 40 mph the mirror would imitate a jet engine with a really cool jet sound. People were really surprised when they sat inside my Reliants and they proclaimed, “It’s just like a real car.” Its exactly like a real car with all the same controls. I think most people were expecting peddles and a joystick attached to a rather large elastic band but I guess that’s thanks to the Media and the way they portray 3-wheeled vehicles as a joke. I had the Rialto until about 1995 when it suddenly seemed to be a large lorry magnet and got hit by numerous vehicles in the space of a few weeks. I managed to keep in going with bits of mesh and several tons of fibreglass matting but a year or so after graduating I decided to take my driving test. After moving into the IT sector where I now work as a “Group Intranet Developer” (a job I was offered as a result of this web site) I bought my first car that had a wheel in each corner; a 1985 Vauxhall Cavalier Estate. I have changed cars a few times since then (click here for my car history) and have a Jaguar X-Type now but despite the comfort of the Jaguar, I just had to buy another Reliant. 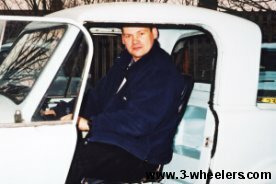 My idea was to buy a Reliant Regal Supervan so that I could create a full sized version of the scale models I had made for this web site in 2002. This I did in February 2004 when I bought a 1972 Reliant Regal Supervan III which was fully restored. The whole restoration process was turned into a restoration manual which resulted in my first published book in December 2005 by Veloce Publishing. In 2005 this web site also acquired its 1,000th page which initially was my goal. In 2000 I thought once I reach 1,000 pages I will stop ... but once I got there I realised there was so much more to add and so the site continues to grow. 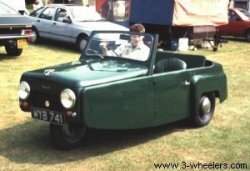 Sadly towards the end of 2008, I had to find new homes for both the Reliant Robin and the Reliant Regal due to the lack of decent garage space. I now just own a 1961 Reliant Regal Mk VI van and since owning it this has appeared in a few programs, the BBC film “Toast”, the film “Soul Boy”, the medical drama “The Royal” and adverts on BFBS3 Television.. In June 2008 my brother and I also drove 5,500 miles to the North Cape and back in a 1990 Reliant Robin LX. This is available as a book. In 2010 3-wheelers.com was 10 years old and the site was revamped from scratch to bring it up to date. 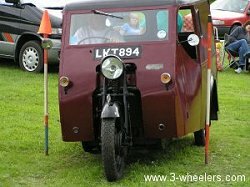 In 2011 with co-author Stuart Cyphus we wrote a new book called The Reliant Three-Wheeler 1935-1973 published by Crecy Publishing. 2011 also saw me get married to Caroline and my first son was born (sadly my father also died) and as a result spare time now gets swallowed up and so time to update 3-wheelers.com gets scarcer all the time - which is a shame given how much there is still to add to the site though work comes first as that pays the mortgage. My mission remains though to keep the web site and ensure it gets updated. 2011 was also the 50th birthday on my 1961 Reliant Regal Mk VI van. 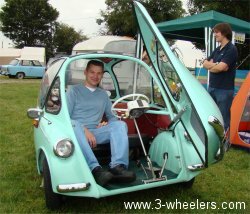 Volume 2 of mine and co-author Stuart Cyphus’ book The Reliant Three-Wheeler 1973-2002 was published in April 2012.). 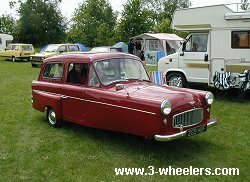 In 2013 I sold my 1961 Reliant Regal Mk VI van and so I am currently without a 3-wheeler. 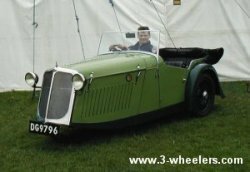 2013 also saw the release of my book The A-Z of Three-Wheelers. In 2015 the website hit a bit of a brick wall and sadly stopped receiving regular updates whilst a year later, my sixth book, The Reliant Motor Company was published. 2016 also saw the creation of a new club called the Reliant Motor Club which I co-founded with fellow Reliant enthusiast, Mark Cropper. 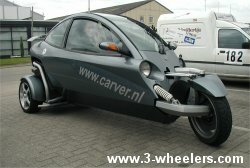 To see some of my other web sites, click here or for the history of 3-wheelers.com, click here. Enjoying the dream in a 2013 Morgan.. Passenger in a 1954 AC Petite. 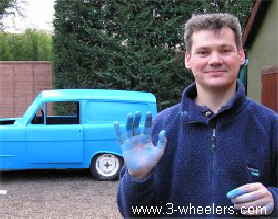 This is me working getting rather blue whilst restoring my old Reliant Supervan III. Big hair do in a 1952 Reliant Regal Mk2. Cautious in a 1934 Raleigh Safety Seven. Squeezed in a 1976 AC Invacar. Squashed in a 1963 Bond Mk G.
Banging my head in a 1971 Bond Bug 700ES.. Relaxed in a 2003 Carver.. Speed demon in a 1949 Reliant 8cwt van. Tall in a 1962 Scootacar. At home in a 1957 Heinkel..